In the very near future, due to overpopulation on the planet and in our jails, the justice system is handling things in a much different way. There’s a more “hands on” punishment in Thomas’ Victimized. As the victim of a crime, you or your family get to choose whether or not to face the guilty parties and duke it out in a ring, or the convicted spend their time in jail. This is where we find Annabelle, a ring rat, frequenting the sentences that criminals of our country serve out, sometimes winning out over their already defeated victims. She’s there to see more than blood being spilled, to see weapons that the victims bring to the ring, hidden, glinting in the lights of the warehouses as they flash across the ring. They find their mark and the crowd goes wild. Annabelle watches with quiet studious eyes. As the story progresses we learn that Annabelle is a victim, awaiting the night when she’ll be able to face her demon head on. Told in an alternating fashion, from present tense to flashback and again forward, we find out all about Annabelle’s trials and tribulations. You can see where one person would blame themselves for the terrible things that go bump in their night. You get a taste of where the victim could very well feel like a criminal themselves. As Anna prepares, we find out the type of woman she’s become, how her past has altered her present, and brought her to this fleabag warehouse, where she steps into the ring, standing across from her own family. 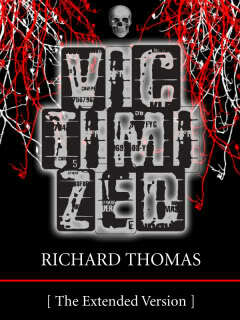 Originally printed in Murky Depths #15, Richard Thomas‘ (author of Transubstantiate) Victimized is now available as an Amazon Kindle Single. When the story was printed in its original format, it was only 5,000 words long, but now in the Amazon Kindle Single format, you get the extended 6,800 word version of the story, a version far superior. And if you haven’t heard of Richard Thomas yet, give it time. He’s described as an upcoming author, work work all over the internet and in print. You’ll hear of him soon enough.